This is a perfect tea time snack for a rainy evening. This can also be served as a starter. 1. Cut Cauliflower in to individual florets. Wash and Keep aside. 2. Boil water with little salt. Switch off stove and then put the florets. Keep it as such for 10 minutes. Drain water completely. 3. Combine all the flours, salt, red chillypowder and garam masala. Add water and make it a thin batter. 4. Heat oil. Dip the florets in the batter. Fry the florets in batches. 5. Drain excess oil on a kitchen towel. 6. Serve as starter or as tea time snack. perfect with tea or coffee... espescially on a rainy day!! Wow lovely crispy and delicious inviting cauliflower fritters. My god. These are yum. yummy starter recipe, looks tempting and delicious. Lovely yummy crispy cauliflower bhaji. Hope u remember me. Your pakora are right option to have with tea in this mansoon season. 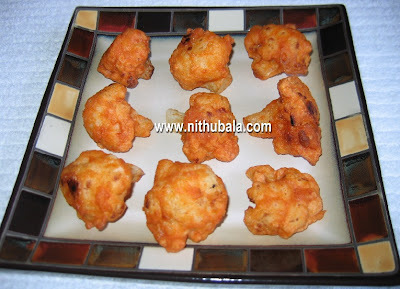 Nithu Cauliflower Bajji looking so tempting !! We are used to take it with Khichdi... Nice one. They look amazing!! Great to have with a cup of masala chai.